There are a variety of funny animal videos to choose from on YouTube. We take videos of dressing our dogs up in funny little costumes, putting our cats in front of the mirror to spook them, and feeding our parrots way more crackers than they can chew. However, what happens when the joke goes too far? Having shared the earth with humans for so long, we’d think mother nature and people would learn to get along. But even animals have their limits. Here are ten funny birds that just lost all patience with humanity. Crows are usually associated with scarecrows, black cats, and witches. In some folklore, they’ve represented the sign of evil. Perhaps that’s why most people are freaked out by these black birds. This man, unfortunately, didn’t heed the warning to stay away. As a result, he gets tormented by the crow. The bird sits on the back of his jacket and pecks away at the poor guys hood. He’ll think twice before messing with this crow again. Approaching an animal that clearly doesn’t want to be bothered is never a good idea. Attempting to interact with a big bird that has a horn is an especially bad judgment call. Though Southern cassowaries are known as fearsome creatures, this bird was clearly provoked. We aren’t sure what the man in the photo was thinking approaching this angry bird but we doubt he’ll approach another bird again. 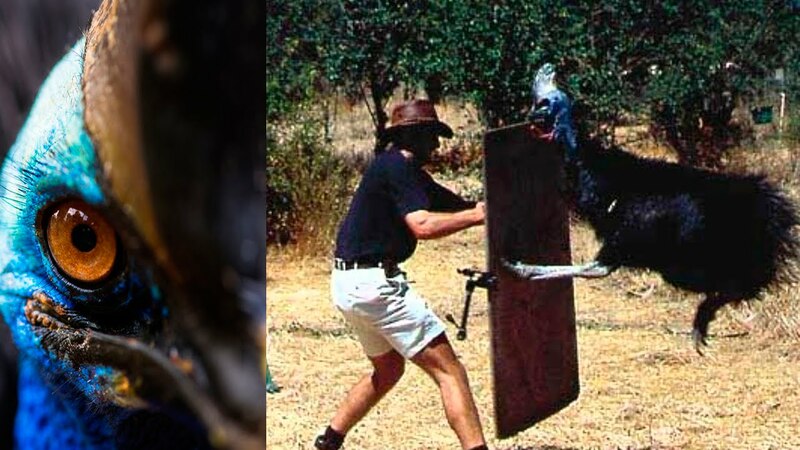 It’s a good thing he shielded himself because these cassowaries pack some powerful kicks! 8 Woman Down! Woman Down! Hawks maybe majestic and fascinating birds to admire from afar, but when attacked by one, it’s a completely different story. The woman in the photo may be all smiles and giggles but from what we can tell, the hawk looks as if he’s about to make her into a dinner dish. It appears as though the bird knocked her down from behind and captured the woman as though she’s prey. This hawk has obviously had it with this lady. Unexplained bird attacks are unfortunate events that happen to some of us poor souls but it’s nothing new. Take Alfred Hitchcock’s 1963 film The Birds for example. That movie was all about birds terrorizing the people on Bodega Bay, CA. This photo is similar to many of the scenes from the horror-thriller film. People are either always running in horror or being chased down. Unfortunately, this woman took a stroll through the wrong park, at the wrong time. She should probably take a detour next time. 6 Warning! Intruder Alert! Intruder Alert! Geese are just one of those birds we see every day. We pass by them on the sidewalks and give them the right of way at intersections all of the time. We’d think because they’re so accustomed to our presence and vice versa, that they wouldn’t attack us for no reason, right? Apparently, this young athlete got a little too up close and personal for these geese. She might’ve just been trying to play soccer, but little did she know that she was trespassing on "Geese Territory". We should all be aware of our surroundings. Otherwise, we’ll get bird-winged like this girl. 5 Yeah, You Better Run! Playing golf is easy enough. But this poor man was stalked and chased down by this goose for reasons unknown. The goose eventually caught up with him and attacked the man as he fell to the ground. Whatever the situation might’ve been, this bird did a serious number on this guy. Feathers flying and all, this goose had just about enough of him. So far we’ve seen grown men and women dodging attacks from birds, or just plain running from them in terror. 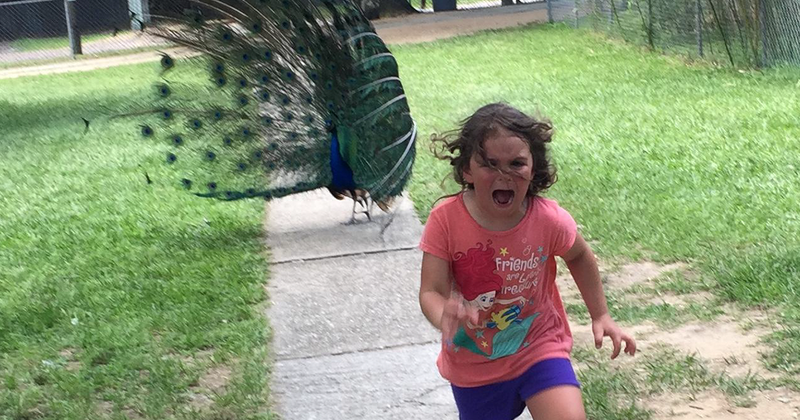 Here we have a child running in horror from a stalking peacock. The big bird seems less than phased by the little girl’s screams and still treads after her down the sidewalk. While we know the girl is terrified, we can’t help but find her reaction to the peacock a little amusing. We’re sure Mommy and Daddy will protect her from the big bad birdy! 3 Get The Story Straight Or Else! Someone should’ve warned the reporter that he’d be broadcasting a news story in an animal enclosure. Cleary, he wasn’t prepared, and it becomes even more apparent when the pelican backs him into a wall and bites his bottom. In other photos, we can see that the reporter looks uncomfortable around the animals from the start. Another photo features an animal attendant trying to control the Pelicans, but she can’t help but laugh at the reporter’s reaction. This guy definitely has a fear of animals. Especially birds that bite! 2 No Hats Or Scarves Allowed! Say someone took a morning stroll along the beach and all of sudden, out of the blue, a seagull attacks them. Well, not them in particular, just that scarf on their head. This seagull was clearly offended by this woman’s bandanna and decided it was time he taught her a lesson. We can see the woman with her back turned at the bird, as it attempts to pull off her bandanna. She doesn’t even shield herself from the attack. That’s one tough lady! 1 A Voyage Through The Great Savanna That Went Wrong! Touring the great African Savanna can be a great experience, so as long we keep our distance from the animals. This tourist took one step too close to this ostrich and ultimately was chased down by the animal. We think he should’ve just stayed in the touring van, along with the rest of the group. Clearly, he hadn’t a clue what he was doing and received the backlash for it. There are reasons why the tour instructor said not to touch the animals–especially the wild ostriches. What Viral Animal Are You Based On Your Myers-Briggs® Type? What Cat Breed Should You Get Based On Your Myers-Briggs® Type? Which MBTI® Is Most Likely To Be In Which Hogwarts House? Which Gordon Ramsay Scream Face Are You Based on Your MBTI®? Which Pair of Glasses Should You Get Based on Your MBTI?